Objectives E-cigarette companies and vendors claim the potential of e-cigarettes to help smokers reduce or quit tobacco use. E-cigarettes also have the potential to renormalise smoking. The purpose of this study was to describe the availability and in-store marketing of e-cigarettes in London, UK stores selling tobacco and alcohol. Setting Small and large stores selling alcohol and tobacco in London, UK. Primary and secondary outcome measures The number of stores selling e-cigarettes, the number of stores with an interior or exterior e-cigarette advertisement, the number of stores with an e-cigarette point-of-sale movable display, store size, deprivation index score for store's corresponding lower super output area. Results Audits were completed in 108 of 128 selected stores. 62 of the audited stores (57%) sold e-cigarettes. E-cigarette availability was unrelated to store size. There was a statistically non-significant trend towards increased availability in more deprived areas (p=0.069). 31 of the 62 stores (50%) selling e-cigarettes had a point-of-sale movable display, with all but one found in small stores. Two small stores had interior advertisements and eight had exterior advertisements. No advertisements were observed in large stores. Conclusions This audit revealed widespread availability of e-cigarettes and in-store marketing in London, UK. Even if e-cigarettes prove to be an effective cessation aid, their sale and use are resulting in an increasing public presence of cigarette-like images and smoking behaviour. After decades of work to denormalise smoking, these findings raise the question of whether e-cigarettes are renormalising smoking. This is the first empirical study to describe the availability and in-store marketing of e-cigarettes in the UK. We used standard methods to improve accuracy by physically enumerating tobacco and alcohol retailers in the field (since there is no tobacco licensing in England) and by using a mobile data collection system. We may have underestimated the true availability of e-cigarettes as we sampled only stores selling both alcohol and tobacco. The low statistical power of this study makes it difficult to reliably assess the association between e-cigarette availability and area of deprivation. Although consumption of conventional cigarettes has decreased in the USA and the UK1 ,2 in recent years, awareness and use of electronic cigarettes (referred to as e-cigarettes in this paper) have increased greatly in the past few years in the USA and the UK3 ,4 E-cigarettes are cigarette-shaped devices that heat a solution of tobacco-derived nicotine and other chemicals to form a vapour that is inhaled by the user. Existing studies on e-cigarette users show that a majority of them try e-cigarettes as a way to quit smoking, reduce smoking or satisfy smoking urges in places where smoking is prohibited.4–6 These trends in e-cigarette use and the rise of e-cigarettes have drawn a mixed7 ,8 but generally a positive reaction9–12 from the public health community, based on the belief that e-cigarettes might be less harmful than combusted tobacco products and may potentially aid cessation. A recent longitudinal study showed that smokers had similar abstinence rates using e-cigarettes and nicotine patches for quitting13; however, another longitudinal study examining variation in quit success between e-cigarette users and non-users showed no differences, which supports e-cigarettes as a potential facilitator for dual use.5 The US Food and Drug Administration (FDA) has expressed concerns over e-cigarettes’ safety and effectiveness as cessation devices14 and has stated a desire to assert jurisdiction over currently non-regulated tobacco products by October 2013.15 In the summer of 2013, the UK Medicines and Healthcare Products Regulatory Agency (MHRA) released its decision to regulate e-cigarettes as medicines in 2016.16 Yet little is known about the social and behavioural consequences of e-cigarette availability and marketing. These pervasive new cues that potentially promote tobacco use are important in a country like the UK, which has successfully banned point-of-sale tobacco advertising in small and large stores, as well as tobacco displays in large stores, with large stores defined as those greater than 280 m2.17 In this article, we present findings of the first store audit of e-cigarettes in the UK. 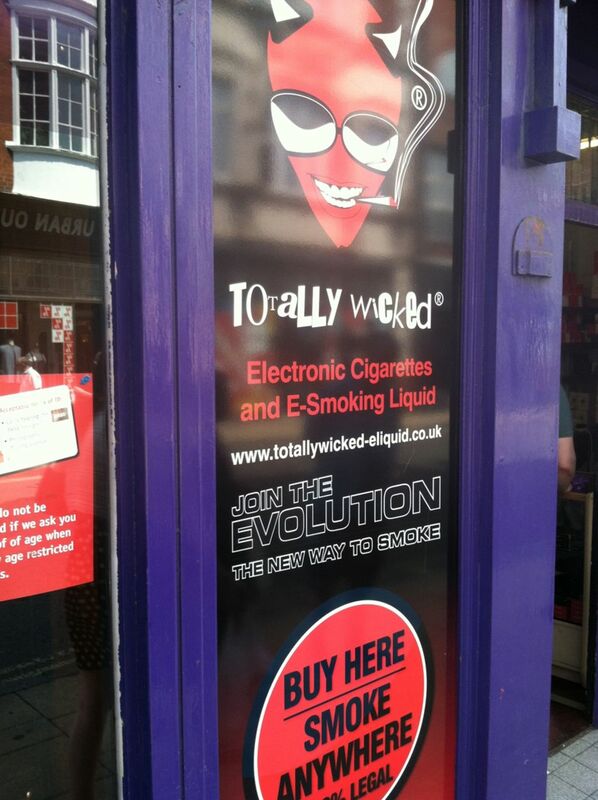 Our primary aim was to describe the availability of e-cigarettes and their promotion in stores. Our secondary aim was to describe the associations between e-cigarette availability and neighbourhood deprivation. The data presented here were collected as a part of an observational point-of-sale audit of the sales and marketing of tobacco products and alcoholic beverages in London, UK stores selling both products. Data collection took place over 3 weeks in June and July 2013. Multistage area-based sampling was used. First, 18 middle super output areas (MSOAs) were selected with the probability of selection proportionate to population size. These MSOAs were composed of multiple lower super output areas (LSOAs), which are a collection of geographic areas of similar populations and social homogeneity created from clusters of adjacent postcodes.18 ,19 Given that England lacks tobacco retailer licensing, we walked each street of each output area by foot to generate a list of all retailers selling both tobacco and alcohol. In total, 128 stores, 116 small and 12 large, were identified through this process. Data collectors conducted store audits using web-based software on a 3G-cellular-enabled Apple iPad Mini. Audits took place primarily between 9:00 and 19:00. On entering a store, the data collector introduced himself or herself (RH or AEM) and briefly explained the study to a clerk or manager in the store. Our audit tool included dichotomous measures for whether stores sold e-cigarettes, promoted them with interior or exterior advertisements, or featured a movable display. Point-of-sale movable displays are branded structures that combine advertising with product presentation. They are commonly found at the cash register and are made of plastic or cardboard. See figure 1 for an example of a point-of-sale movable display and figure 2 for an advertisement. Point-of-sale movable display that invites store customers to sample the e-cigarette by providing disposable plastic covers to put over the tip. An example of an exterior e-cigarette advertisement. We used store postcodes to identify the corresponding LSOA deprivation index score based on the 2010 English Indices of Multiple Deprivation,20 with higher scores indicating higher levels of deprivation. We divided our data based on the quartiles for the entire set of deprivation scores. We classified stores into two categories: small (<280 m2) and large (≥280 m2). We were interested in differences in e-cigarette availability and marketing possibly resulting from the tobacco display ban in large stores. E-cigarettes, which are not considered tobacco products in the UK, could be an attractive product to large stores by allowing them to continue drawing revenue from smokers since their display and marketing are not restricted. Stores of an ambiguous size were measured using a laser-measuring device. Descriptive statistics were computed to characterise e-cigarette availability and promotion. χ2 Tests were used to examine associations between the following: neighbourhood deprivation and e-cigarette availability; store size and e-cigarette availability; store size and the presence of point-of-sale movable displays and store size and the presence of advertisements. Data analyses were performed in SPSS (V.21.0, IBM Corp, Armonk, New York, USA). A map of the sampled areas is shown in figure 3. We attempted audits in each of the 128 identified stores, of which 108 audits were completed (96 small and 12 large). Twenty audits were incomplete due to store refusals (n=18) or stores being closed (n=2), giving an 84% (108/128) completion rate. The audited stores spanned areas of low and high deprivation (4.43–64.32; mean 28.70 (SD 12.30)) but on average were in areas of higher deprivation than for England as a whole (mean 21.67 (SD 12.35)). (Two stores were excluded from this analysis because their postcodes did not yield corresponding LSOA deprivation index scores.) Ten of the 12 large stores were part of chains (eg, Tesco and Sainsbury's), while nearly all of the small stores appeared to be independently owned. 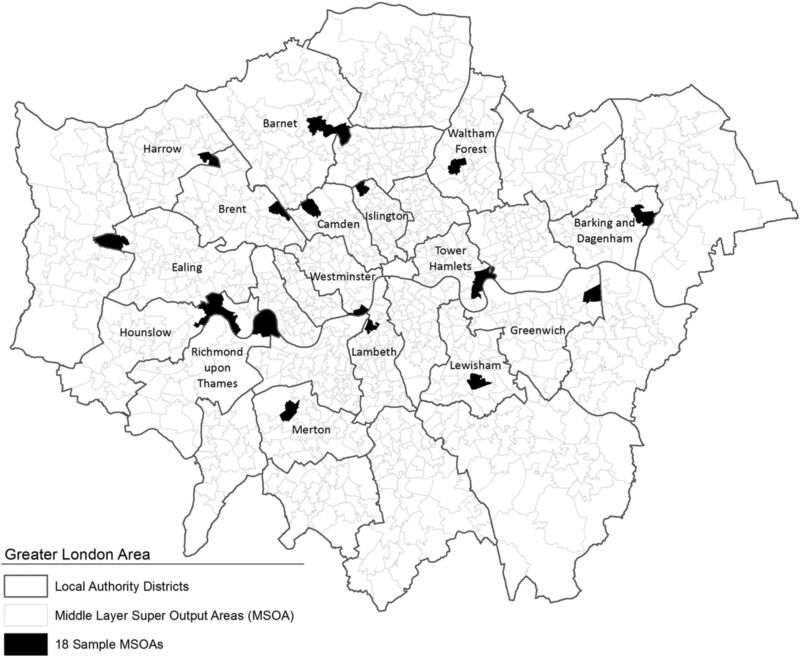 Map of the sampled areas in London, MSOAs, middle super output areas. Overall, 62 of the 108 stores sold e-cigarettes (57%): 53 of the 96 small stores (55%) and 9 of the 12 large stores (75%). The distribution of e-cigarette sales in small and large stores was not significantly different (χ2 2.490, df=1, p=0.115). There was a statistically non-significant trend towards stores located in higher quartiles of deprivation to be selling e-cigarettes, with 46.9% of stores in the most deprived quartile selling e-cigarettes, compared with 37.5% of stores in the least-deprived quartile (χ2 7.103, df = 3, p = 0.069). Thirty-one of the 62 stores selling e-cigarettes had a point-of-sale movable display (50%) with all but 1 of these being in small stores. Small stores were more likely to have a point-of-sale movable display (χ2 6.369, df=1, p=0.012) than were large stores. Two stores had an interior advertisement (2% (2/62)) and eight stores had an exterior advertisement (15% (8/62)), with none of these being in large stores. However, there was no significant difference between small and large stores in the presence of advertisements (χ2 1.560, df=1, p=0.212). Our results show a high availability of e-cigarettes in small and large stores, with an overall availability of 57% (95% CI 48% to 67%) in our study sample. This is significantly higher than the 34% rate we found in an unpublished 2012 national study conducted in the USA, in the only other audit of e-cigarette availability. Given the recent increased investment in e-cigarettes by the tobacco industry,21 ,22 continued growth in e-cigarette availability is to be expected. 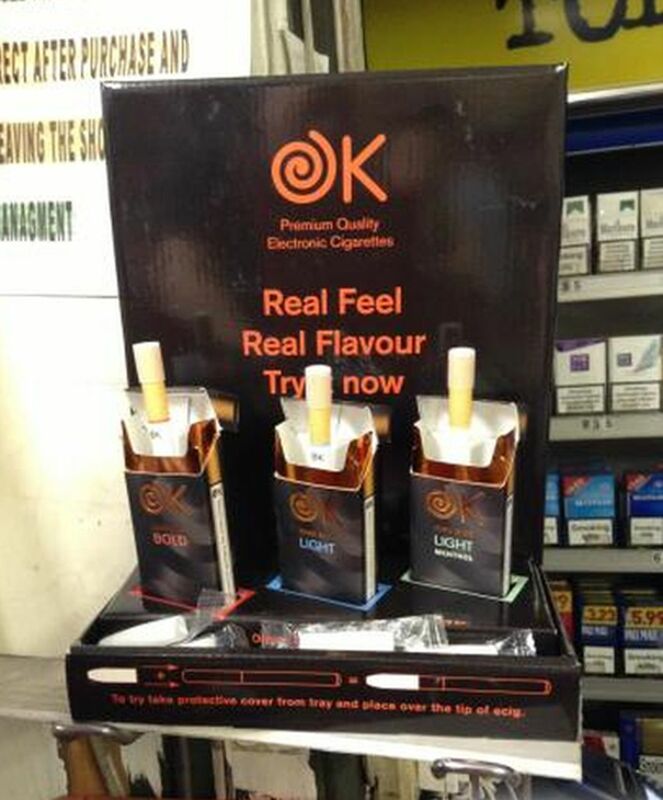 Small stores had a noteworthy amount of e-cigarette marketing materials in the form of point-of-sale movable displays but not advertisements. Many of these point-of-sale movable displays engaged consumers directly by inviting them to try the product (see figure 1). We also noticed after beginning data collection that some small and large stores had e-cigarette brochures available at the point-of-sale, which can be included as a measure of the presence of marketing materials in future studies. In contrast to the USA study, which found that e-cigarettes were more prevalent in areas with higher household incomes, we found a statistically non-significant trend towards higher availability in more deprived neighbourhoods. Given that existing studies on e-cigarette user profiles show that most are existing or former cigarette smokers,4 ,23 we speculate that this trend reflects the higher rate of smoking in more deprived areas.24 Furthermore, the cost-effectiveness of e-cigarettes compared to conventional cigarettes, as emphasised in observed marketing materials, could make them more attractive to smokers in more deprived areas. Our study has two key strengths. First, it is the first empirical study on e-cigarette availability and promotion in the UK. Second, given the field context of our study, we used standard methods to achieve accurate data collection, including physically enumerating tobacco and alcohol retailers and using a mobile data collection system on a tablet device, a recent trend in point-of-sale audits.25–27 Potential advantages of a mobile data collection system include reducing data entry errors, having a single device for data collection that includes taking photographs and making the data collector less conspicuous than she/he would be using a clipboard given the ubiquity of tablet devices. The limitations of the study can be attributed to the nature of our sampling. With low statistical power, especially in large stores, it is difficult to come to a firm conclusion about the association between e-cigarette availability and neighbourhood deprivation, as well as differences in the availability and marketing of e-cigarettes in small and large stores. We only sampled an urban area and audited retailers selling both tobacco and alcohol, so our results cannot be generalised to the UK and for all types of retailers. Although the MSOAs of our audited stores were not completely representative of England, they were diverse, varying in population density, ethnicity and household number. In summary, even if e-cigarettes are proven to provide a safe delivery mechanism for nicotine and are an effective cessation aid, their sale and use have resulted in a renewed and increasing public presence of cigarette-like objects, images and smoking behaviour. After decades of work to denormalise smoking, the question of whether e-cigarettes are renormalising smoking merits urgent empirical study. The authors would like to thank Milica Vasiljevic, PhD, and Rachel Pechey, PhD, for their valuable comments on the manuscript, Chris Lowry and Katy Scammell of ASH for their assistance with data collection, and Lisa Isgett for preparation of the map shown in figure 3.
. Consumption of cigarettes and combustible tobacco—United States, 2000–2011. Centers for Disease Control and Prevention, Report number: 30, 2012. Smoking statistics: who smokes and how much (Fact Sheet). Action on Smoking and Health (ASH). 2013. http://ash.org.uk/files/documents/ASH_106.pdf. (accessed 18 Dec 2013).
. Awareness and ever use of electronic cigarettes among U.S. adults, 2010–2011. Nicotine Tob Res 2013;15:1623–7.
. E-cigarettes: prevalence and attitudes in Great Britain. Nicotine Tob Res 2013;15:1737–44.
. Do e-cigarette have the potential to compete with conventional cigarettes? A survey of conventional cigarette smokers’ experiences with e-cigarettes. Chest 2013;144:1609–14.
. Should electronic cigarettes be as freely available as tobacco? No. BMJ 2013;346:f3840.
. Electronic cigarettes: miracle or menace. BMJ 2010;340:c311.
. Should electronic cigarettes be as freely available as tobacco? Yes. BMJ 2013;346:f3845. Polosa R, Morjaria JB, Caponnetto P, et al. Effectiveness and tolerability of electronic cigarette in real-life: a 24-month prospective observational study. Intern Emerg Med 2013:1–10. Epub 2013/07/23.
. Commentary on Wagener et al. (2012): e-cigarettes: a vulnerable promise. Addiction 2012;107:1549.
. Electronic cigarettes: achieving a balanced perspective. Addiction 2012;107:1545–8. Office of Information and Regulatory Affairs. Tobacco products subject to the Federal Food, Drug, and Cosmetic Act, as amended by the Family Smoking Prevention and Tobacco Control Act. [Online] http://www.reginfo.gov/public/do/eAgendaViewRule?pubId=201304&RIN=0910-AG38 (accessed 20 Aug 2013). Medicines and Healthcare Products Regulatory Agency. UK moves towards safe and effective electronic cigarettes and other nicotine-containing products. [Press release] 12 June 2013. Action on Smoking and Health (ASH) Briefing: Tobacco Displays at the Point of Sale. 2012. http://ash.org.uk/files/documents/ASH_701.pdf. (accessed 18 Dec 2013). Office for National Statistics. Output areas (OA). [Online] http://www.ons.gov.uk/ons/guide-method/geography/beginner-s-guide/census/output-area--oas-/index.html (accessed 6 Aug 2013). Office for National Statistics. Super output areas explained. [Online] http://neighbourhood.statistics.gov.uk/HTMLDocs/nessgeography/superoutputareasexplained/output-areas-explained.htm (accessed 21 Aug 2013). United Kingdom Government. English indices of deprivation. 2010. https://www.gov.uk/government/publications/english-indices-of-deprivation-2010 (accessed 9 Aug 2010).
. Big tobacco lights up e-cigarettes. BMJ 2013;346:f3418.
. Factbox: big tobacco companies bet on e-cigarettes. Reuters, 2013. http://uk.reuters.com/article/2013/06/13/us-ecigarettes-factbox-idUSBRE95C0FG20130613 (accessed 10 Aug 2013).
. Residential area deprivation predicts smoking habit independent of individual educational level and occupational social class. A cross sectional study in the Norfolk cohort of the European Investigation into Cancer (EPIC-Norfolk). J Epidemiol Commun H 2003;57:270–6.
. Retailer Adherence to Family Smoking Prevention and Tobacco Control Act, North Carolina, 2011. Prev Chronic Dis 2013;10:120184.
. Marketing little cigars and cigarillos: advertising, price, and associations with neighborhood demographics. Am J Public Health 2013;103:1902–9.
. Meta-analysis of cue-reactivity in addiction research. Addiction 1999;94:327–40. Contributors AEM, KMR and TMM designed the study. AEM and KMR provided the data collection software. AEM and RH collected data, and RH conducted data analysis. TMM had the idea for the paper. RH drafted the paper, with AEM, KMR and TMM contributing to subsequent drafts. All authors approved the final manuscript. TMM is the guarantor. Funding This study was funded by a joint grant from the University of Cambridge, England and the University of North Carolina at Chapel Hill's Gillings School of Global Public Health, USA. The Behaviour and Health Research Unit (BHRU) is part funded by the UK Department of Health Policy Research Programme as the Policy Research Unit in Behaviour and Health (PR-UN-0409-10109). This study was conducted independently of the funders, and the views expressed in this paper are those of the authors and not necessarily those of the funders. Competing interests KMR and AEM have developed the Counter Tobacco Store Audit Center data collection system used in this study and a Store Mapper tobacco retailer mapping system (not used in this study). Both will generate royalties when licensed. KMR and AEM receive compensation as the Executive Director and Deputy Director, respectively, of Counter Tools, a non-profit organisation with the mission to disseminate the Store Audit Center and the Store Mapper, and associated training and technical assistance to communities addressing point of sale tobacco control issues. RH was funded as a summer intern through the Roy and Diana Vagelos Life Sciences & Management Program and the Elliman Internship Fund.